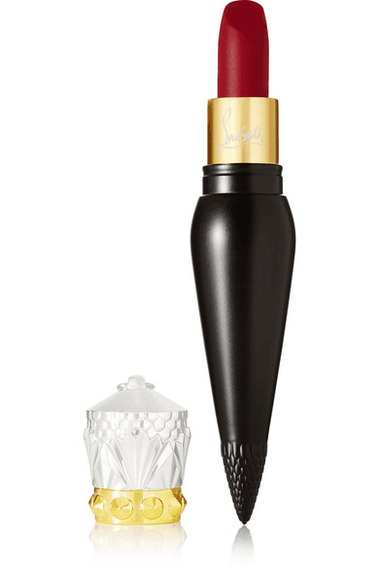 Christian Louboutin Beauty's range of 'Velvet Matte' lipsticks are highly pigmented and enriched with emulsifying extracts to deliver optimum coverage with a suede-like finish. Inspired by the soles of the brand's iconic heels, 'Rouge Louboutin' is the signature red from the collection - represented by the contrasting black case. Wear this classically glamorous hue for day or evening. - Packaged in matte black vial that can be worn as a necklace - Enriched with natural oils and seed butters - Free from parabens, phthalates and DEA - Rouge Louboutin Silk Satin Lip Colour and Sheer Voile Lip Colour also available -Instructions for use: - Apply to the heart of the lips, working outwards to each corner - 3.8g/ 0.13oz.